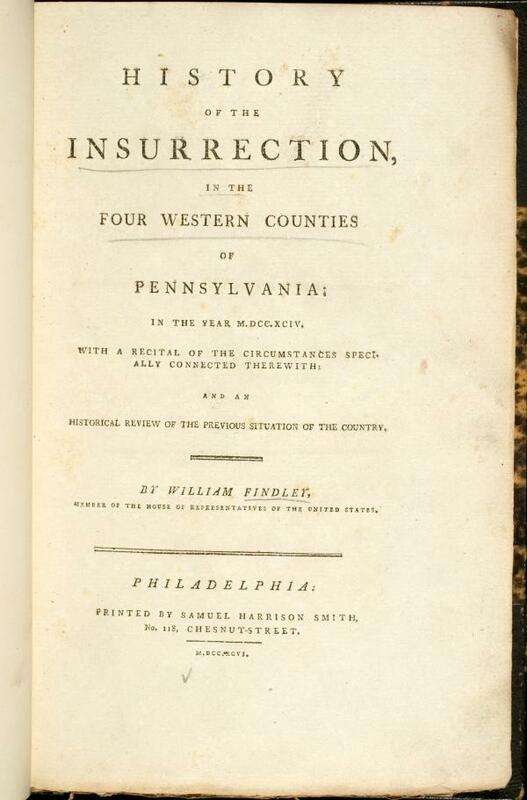 William Findley, Title page of History of the Insurrection in the Four Western Counties of Pennsylvania in the Year 1794, Philadelphia, 1796. Flip to William Findley, by Rembrandt Peale, 1805. In Congress, William Findley loudly opposed Secretary of the Treasury Alexander Hamilton's influence on processes he considered to be strictly under the domain of the U.S. House of Representatives. In the 1792 Congressional debate over a new whiskey tax, Findley caused Hamilton's arguments for the new excise tax to stop being read aloud in Congress. In his 1796 History of the Insurrection, Findley replied angrily to Hamilton's official 1794 report on the Whiskey Rebellion and publicly accused Hamilton of provoking the insurrection merely to create a cruel excuse to suppress it.